A new tour through Belgrade shows visitors the rise and fall of Yugoslavia. In a Yugo! 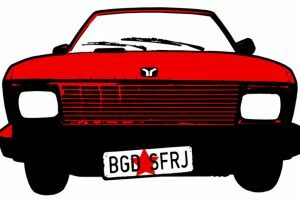 Yugotour is a new tour offered to the visitors of Belgrade, where they will have an opportunity to get to know the communist past of Yugoslavia from the back seat of a Yugo automobile. The launch of Yugotour will be celebrated with a matinee held on Sunday, May 31, from 17:00. in KC Grad. The matinee will be preceded by a ”Yugo ride” that welcomes Yugo owners to join the ride that will start at the Museum of Yugoslav History and end in KC Grad. “The most unique feature of Belgrade is that it is the capital of a country that does not exist for more than twenty years. Everywhere in Belgrade you can find traces of Yugoslavia, from the Yugoexport shops to the building of SIV. Visitors are very interested to learn about Yugoslavia and Tito, but there is hardly any way to do so in Belgrade. I believe there is only one proper way to see and discover all these places that tell the story of Yugoslavia: in a Yugo car!”, said the founder of Yugotour, Dutchman Ralph van der Zijden. Yugotour is an attempt to revive and preserve Yugoslav socialist heritage and make it more known and closer to tourists in an unorthodox way. In cities like Budapest and Berlin socialism-tours in Trabants are very popular, but for Belgrade this kind of tour is unique and first of its kind. The tours will be in English while driving around the city in a Yugo car, visiting the most prominent landmarks of the Yugoslav era while the driver/guide will tell the stories of past times.